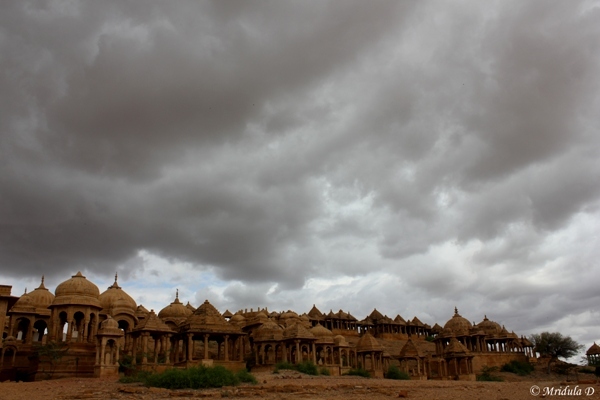 I visited Jaisalmer recently on invitation from Suryagarh. We went on a temple trail which included the lesser known temples of the region like Navdungar temple. 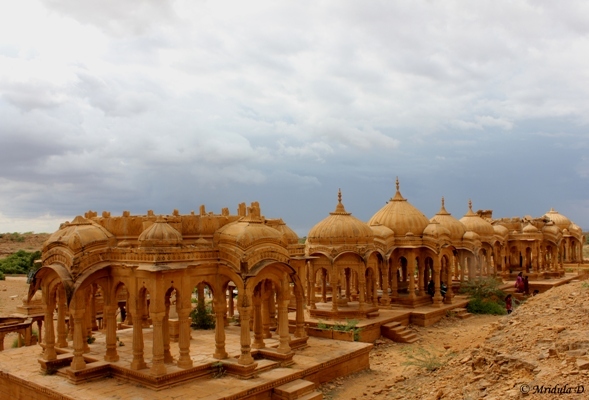 But it also included the royal cenotaphs at Barabagh Jaisalmer. The ride to the cenotaphs was smooth. The skies were moody on the day for sure. The Bada Bagh or Bara Bagh (meaning big garden) is where the cenotaphs for the royal family of Rajasthan are located. It was constructed by the King Jai Singh in the 16th centuary. A cenotaph was constructed when a king died. A cenotaph means a memorial to someone who is buried somewhere else. On this trip, Karan the GM of Suryagarh told us at arrival, “please feel free to throw away the itinerary.” It really surprised me,as no one says it on a FAM trip but we literally took his advice to heart. So we were liberally running late and if we wanted to head towards Dessert National Park, it meant spending very little time here. I actually spent 10 minutes at the Barabagh and it does not do any justice to the place. I ran to the top of the place to get a better view and click some pictures. I sincerely wish I had more time to spend here. The cenotaphs are ’empty tombs’ and the earliest known memorial here is for the King Jai Singh. In those 10 minutes I only saw a signboard that carried the name of the place and some do’s and don’ts. But chances are I might have missed a more detailed signboard explaining what the place was all about. But then given that this is India there might be no more information at about the place. It was not too crowded when I was there. And I promise you will see more pictures from Bada Bagh when I write about the temple trail.